I think it turned out really well. We just ripped that bottom shelf out and re-stained the area where it used to be. You would hardly even know that a shelf was ever there unless you looked really closely. And that, my friends, is our living room! If you are interested in the before before, check out this post. I love the built-in makeover. I really like that the TV isn't the center of your living room! Our sadly is the center of ours mainly because of where Adam insisted the able outlet go, but oh well. 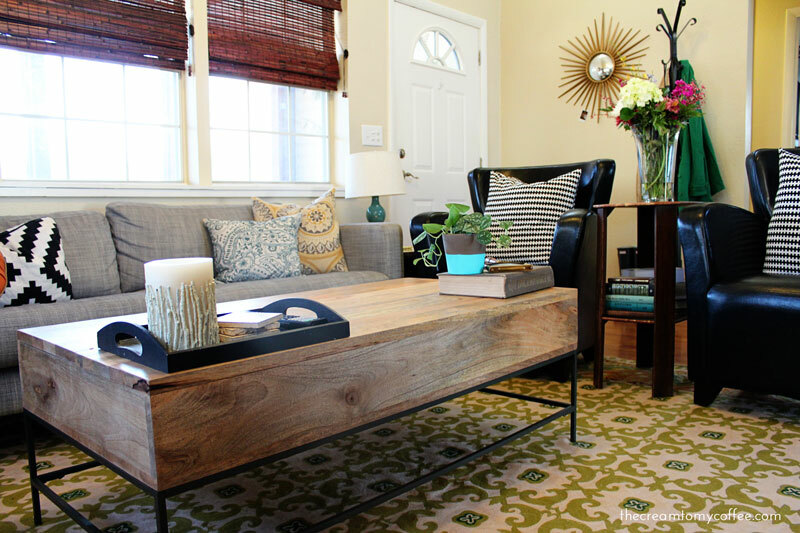 The coffee table is to die for, I love how it opens up so you have some extra hidden storage space too! oh my gosh, so fancy! i love your living room. i definitely love the new set up better, nothing wrong with the old one, but LOVE the new one. and i love your couch. i want a Karl, but I am thinking of getting the sectional. do you love him? ok i pretty much love everything in this post, you're such a fab decorator. come, help me? thanks. Thanks so much Kristen!! I really wanted the Karl sectional, but (as you can see) there is no room for one. My friends have it and they love it! I really like ours, but I always have to tell people that we have a 90lb dog that lives on it, so it definitely shows a little bit of wear. I will say that my friends don't have dogs, and theirs looks great! This is absolutely darling! I love your sense of style and all the colors you used. And the room really does look bigger! I love it! I think you definitely made it look better. Also, I really love all the patterns you've incorporated into your decor! Love it! I tend to get stuck into one idea for a space, and then I can't imagine other ways for it to be. But I love the idea of rearranging things! I should really think about what rooms could be shaken up a bit! 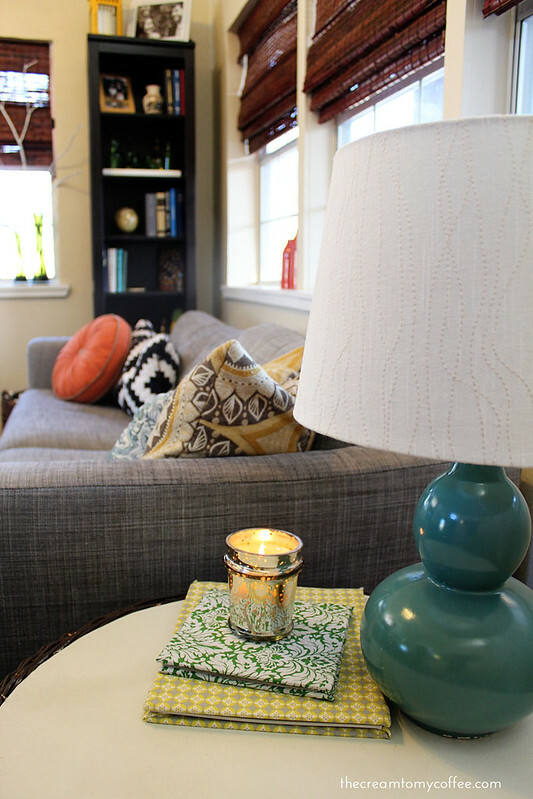 Isn't it amazing what a little furniture rearranging can do to really update a space? Love your pictures! What camera and lens do you use? Thanks so much Amanda! It really is crazy that a little rearranging can make things look totally different! I have a Canon T3i and I usually use this 50mm lens, but for these I just used the kit lens (18-55mm) lens. I pretty much know nothing about cameras, but my friend taught me how to shoot manual on mine and I really think hat makes all the difference! Oh how exciting! It is an AWESOME coffee table. I had been eying for two years before we got and it's safe to say that we love it and it seems like it will last for a really long time. It's obviously great for small spaces too with the extra storage. That print is by a guy named Mike Lowry (I put the link below). I'm excited to see what prints you come up with! I love your living room! I really like the color and pattern of your rug! I love it! It looks great. so light and comfortable. That looks great, seriously! I love your new coffee table, and I think it was a brilliant idea to stash the tv on that built in cupboard/shelving unit! Wow this room looks so great! Like something you'd see as an "after" on an HGTV show! 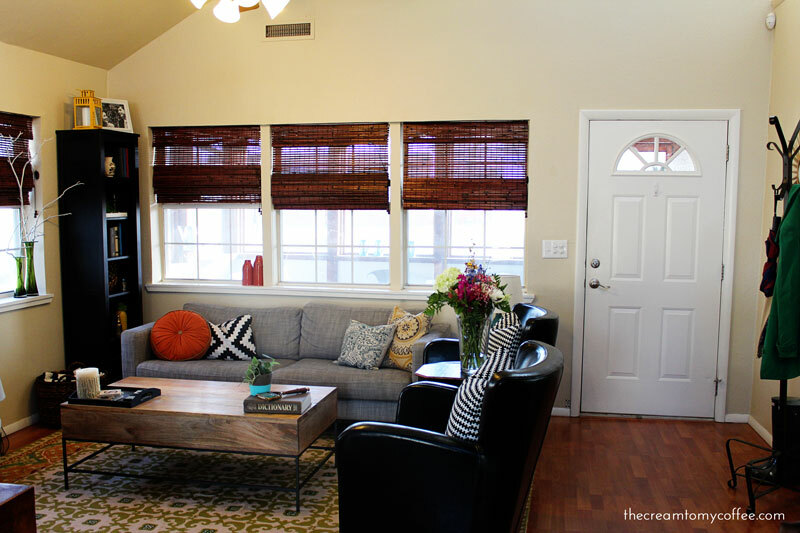 Also, I'm super jealous of how much natural light you get in your living room! What a wonderful mix of pieces and pops of color! And I love the way that great big rugs pulls it all together! Now I want to see the rest of your home! 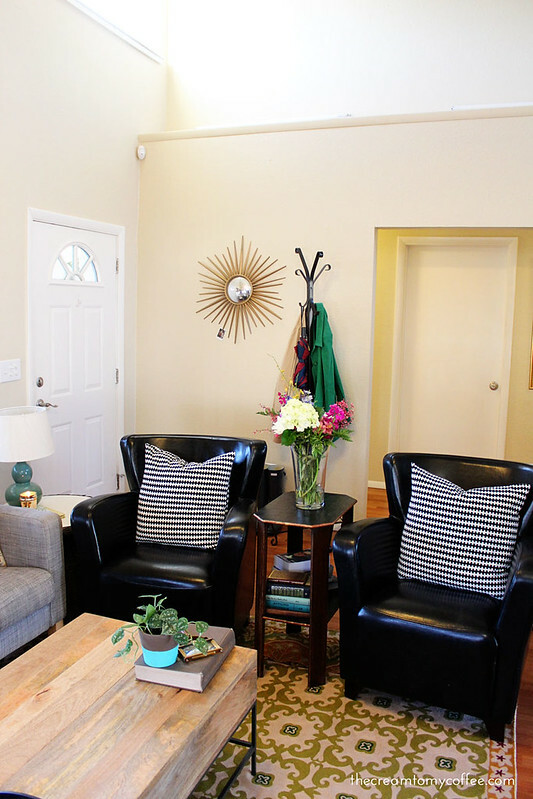 it's amazing how much even a little change can update and elevate a space. Love the new coffee table! It looks great! I love a change. The colors are so bright and cheerful. I love your space! It looks just fabulous! Love the area rug! Ouuuuu! 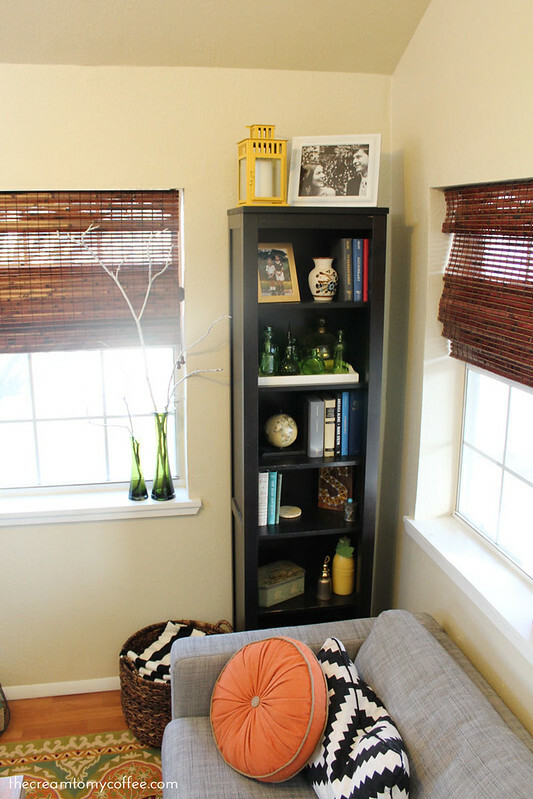 I love re-dos, makeovers, etc especially ones with small space challenges - 3 cheers for Ikea! Your living room reminds me of World Market, which I love, and I have to say that I'm impressed by your finishing touches. Finishing touches seems to be the part where I move on to something else. 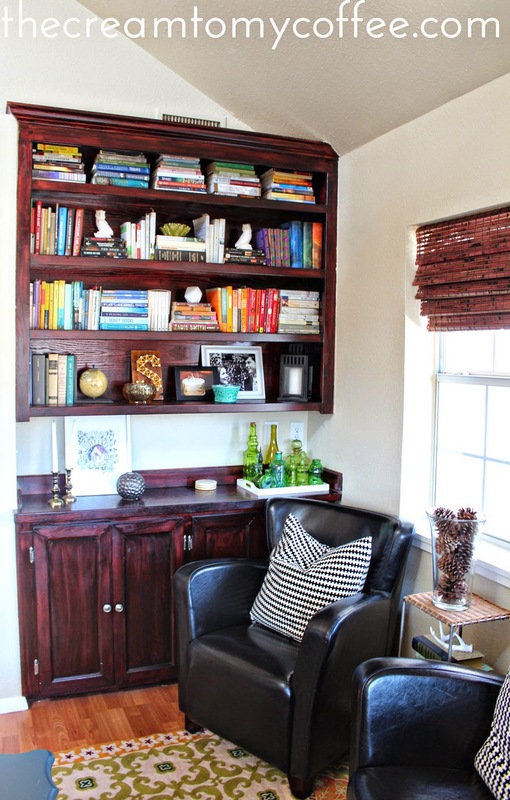 Love the built-in and shelves with lots of things for me to look at. ;) Nice job, Ashley! 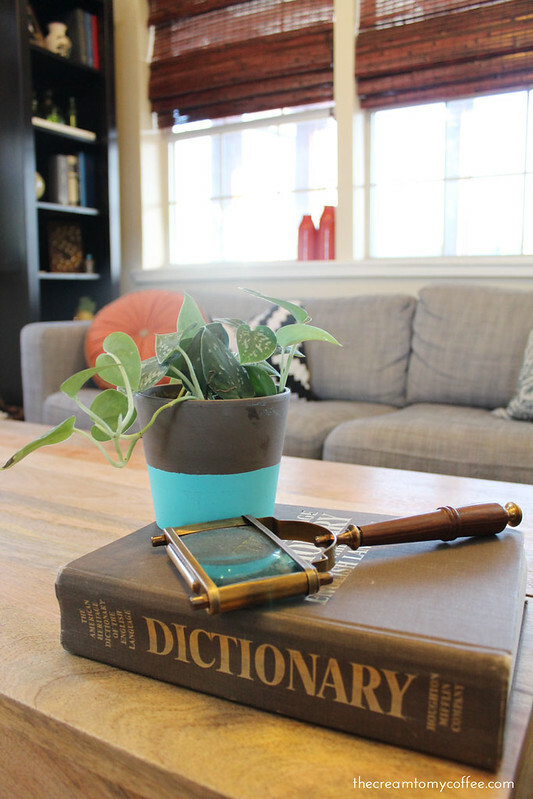 Such a lovely and happy space, Ashley! 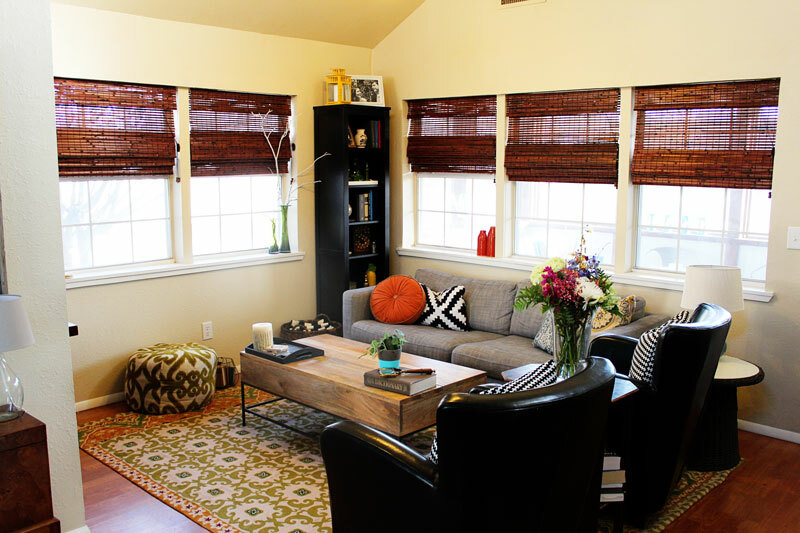 Love the bright colours and the sunshine in your living room. It looks so much better rearranged. 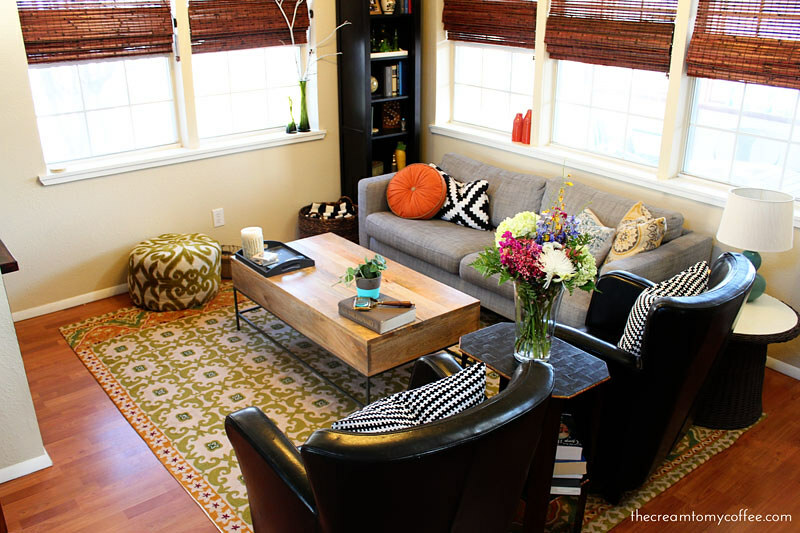 The orange cushion on the couch, the rug and the cute planter on the coffee table add so much cheer to the room. Ooh, I love the new arrangement! Sometimes finding a good spot for the TV can be so hard, especially when you have big windows. I really like the new coffee table, it adds so much to the space! Just perfect! I love it!! I like how it is pretty neutral but has great pops of color! So pretty! You guys did a great job redecorating. I would have made my BF (if I had one) move all the furniture also! 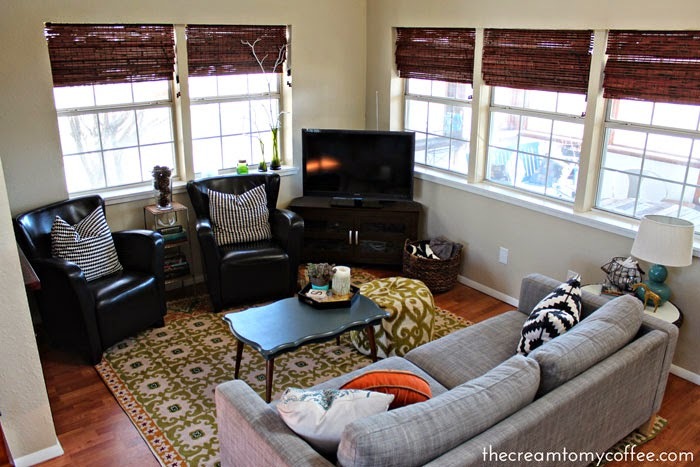 I love how light and airy the room is and I LOVE the coffee table! Looks good! 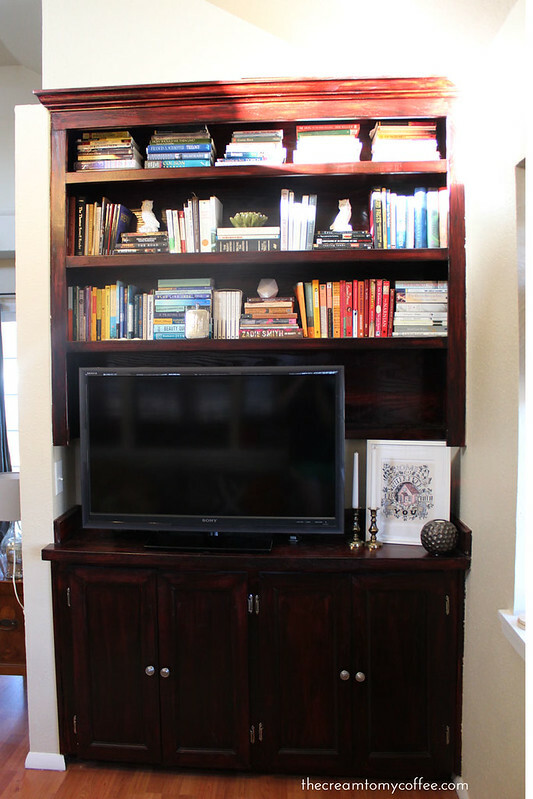 Great idea to use the built in to house your tv! I love the built ins and the coffee table. It feels more open even though it was gorgeous before. the chairs in their new spot is so much better. now your room looks bigger, and you didn't even have to get rid of any furniture. Love the new look - when you did you first makeover I liked it a lot, too, but this looks even better. We have that same Ikea couch and cover in the love seat size. Our cats have scratched it up pretty badly, but that's one of the reasons we chose Ikea. Eventually, we can just replace the cover! I'm glad you are on Instagram - looking forward to following you! My username is the same as my email (without the dot). I hope you are able to follow me as well. I have to tell you how much I have enjoyed looking through your house tour! Everything seems so nicely put together, but still REAL (not like, overly Pinterest-y making me feel bad about myself.) Also I'm so impressed with how you have really made the most of your space. Nice work & thanks for sharing!! It's funny because my friend pinned that gray couch yesterday and I've been thinking about it all day...then here it is again! It's kinda perfect, isn't it? Still a neutral color, so you could switch up your color scheme whenever you wanted, but not white so it stays clean!